Genesis Sonic the Hedgehog (any,r1) in 14:25.23 by Tee-N-Tee. Sonic bounces around surprisingly fast. The lack of Spin Dash makes the strategy a bit different from that of Sonic 2 and Sonic 3 & Knuckles runs, since preserving your momentum becomes a lot more important. However, this doesn't prevent the author from achieving crazy velocities even with such a significant limitation. 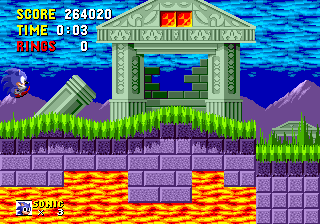 In this run, the game is completed without collecting any emeralds. This is the eighth run of this game, improving on the previous effort by 3.18 (of in-game time), primarily due to higher optimization. See this run played back on a real Genesis.